Curious if you considered other app launching programs like Launchy? I used to use launchy until vista/7 came out and I could simply hit the windows key and start typing the program I wanted to open. I haven’t switched to win8 yet, so don’t know if that feature is still around. Thanks for mention the program Launchy which I was not aware of until now. As a concept, I like App Launcher. 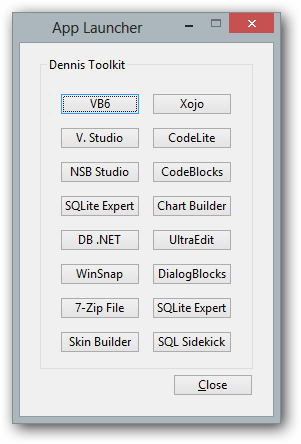 I achieve the functionality by creating a folder on my (Win7) desktop with shortcuts to all my favorite programs. Is this not possible with Win8? Yes, it’s possible to do so as You do in Windows 7. This is a test pilot to see if there exist an interest of using a tool like App Launcher where we can add/remove/update the tool. What I did not mention in the article is that with a tool like App Launcher we can add start parameter(s) allowing us to have various options for one tool. I have noticed at times that I can’t click on the task bar though I see the icons. Usually is it seems related to have a “Metro” app open at the same time. Note sure which apps. I haven’t spent much time on it yet. I use Start8 and ModernMix by StarDock (http://stardock.com/products/start8/). Basically, though I am running Win 8 Pro I work in the desktop environment 95+ percent of the time. Using Start8 I can add back the Start Menu and boot directly to the desktop. I personally don’t have too many issues with the Windows 8 Menu or Apps but since I use mostly Excel and the Office apps along with various Adobe desktop apps I just remain in the desktop mode. Yes, I have the same experiences. However, for me it looks randomized. Start8 looks interesting. Despite the 8.1 the start button will not be the same functionality as in Windows 7. So we still may need some alternatives.